What is the Base Model Pet Door? This is our supreme quality Pet Door for Sliding Glass Doors. You can use the base model pet door insert on its own (e.g., in the laundry) or with a Screen Door Adapter fitted (i.e., for security, use of screen door). How is the Base Model different to the PatioLockTM model? Unlike the PatioLockTM model, the Base Model does NOT have its own locks to lock on to the existing glass door lock mechanisms. So another method to secure the glass door is needed, which tends to involve some degree of screwing, drilling, cutting, handy skills, time, hardware, inconvenience, and so on. Options for locking the base model set up are outlined below in the next section. How do you lock the glass door when you buy our Base Model pet door for sliding doors? 1. ADD the Screen Door Adapter at checkout. The Screen Door Adapter is needed to transfer the existing lock catch plate for the glass door from the wall frame on to the adapter. 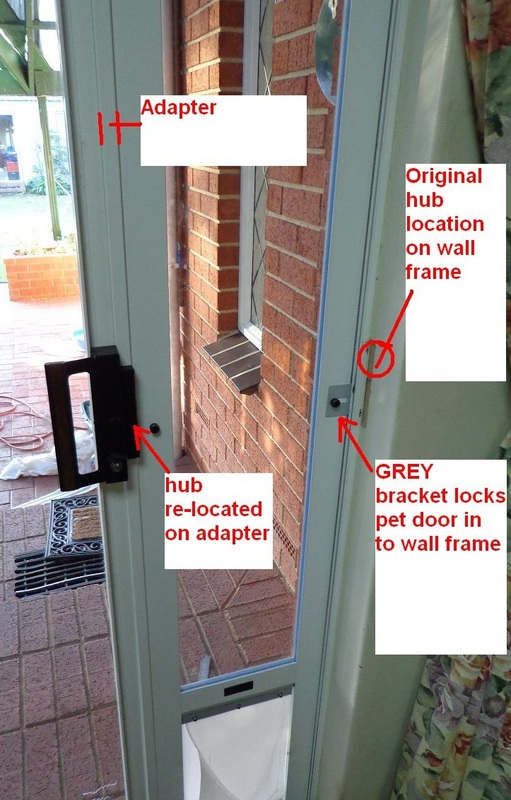 This process will lock the glass door to the pet door but it requires screwing, drilling, handy skills, about 2-3 hours to install (refer to the picture below for reference of transferring locks on to the adapter). You will be leaving screw holes in the sliding door frame and pet door, so not a good option for renters or home owners who do not want to leave holes in their frames. Note the Screen Door Adapter is also needed if you want to use your fly/security door (if you have one). 2. Rod in track (included): A rod can be cut and placed in the floor track behind the sliding door (cutting required) to wedge the sliding door against the pet door. This simple yet crude option may suit those putting a pet door in the laundry and/or provides a way to wedge the glass door into a Screen Door Adapter without screwing holes (rather than transferring lock mechanisms). 3. A patio bolt: This is a key operated pin that can be fitted to the sliding glass door frame to pin it against the pet door. However, drilling and screwing and handy skills are required to fit this and they cost about $15-20 each from hardwares. Should I buy the PatiolockTM or Base model dog door for sliding doors? This depends on your individual needs and circumstances. The Base Model is a good fit for the Home Owner AND Handy-skilled OR those on a Budget...If you are a home owner and have access to someone who is handy and has tools and are not fussed about screwing holes and cutting to size then the base model pet door is a good choice as it is cheaper and can achieve security for both the glass door and screen/security door. Please note you need to buy a screen door adapter if you want to transfer locks for the glass door for lock alignment, even if you don't have or care about your screen door. The base model pet door insert is also a great option for those on a tight budget because you can simply insert the pet door panel in the sliding door frame and then cut the rod (included with every pet door) to wedge the glass door against the pet door. Simple yet effective but also you are getting a premium temporary pet door due to factory direct pricing. Great for home owners who are not handy or are time poor but want security! Please refer to the home page for the checklist steps to run through to before placing your order. Ignore the step about the lock compatibility if you are buying the base model. Free pet access means you can SLEEP at night uninterrupted! If you do have any questions, check out the Home page or FAQ page or feel free to email at sales@modernpetdoors.com.au or call on 0431 908 929. Pick one Adjustable Screen Door Adapter +$80. No Cutting! Multi-use! Easy Instal. No Handy Skills. Non-Adjustable Screen Door Adapter +$60. Requires cutting. Single-use No thanks- I don't want to maximise security nor use my screen door. Warranty: Our doggie doors for sliding doors all come with a 10 year warranty that covers all moving parts including the flap. We make tough cyclone-rated Pet Door Inserts to suit the harsh Australian environment and thus can easily back our product 100%. Our pet doors and accessories are over-engineered to ensure a very long warranty can be offered to you for your peace of mind. So easy to install! Looks great like part of the house and Julian is very responsive with any queries. I love my new doggy door, and how easy it is to take in and out. I also take it around to my families house when they are looking after my dog. It's easy and super convenient. The delivery was really fast - I ordered on Wednesday and received it on Friday (and I'm in regional Victoria). Great communication, great delivery and great product. Great product only one that actually fits my dogs (XL flap) without drama ! Would be great if saloon style doors could be attached to this door as flap is so long , just a suggestion , would make going in/out easier !! We are extremely happy with our Pet Door. It is made with quality materials and looks as though it has always been part of our patio door. Instructions were very easy to follow and the video on line was also of great benefit. We ordered on a Sunday evening and received it Tuesday morning. Fabulous service. We have the XL size for our Neo Mastiff who is 60kg and still growing, and he could easily fit if he was alot bigger. He took a bit to get used to the flap but now he loves his freedom. Really happy with how quick and easy it was to put up. We have dual sliding doors and we have managed to make it work with full use of both doors although we mostly just use the 1 door. Amazing they have no trouble getting through the door even though they are quite tall. Very happy. Having viewed many similar products in person the build quality of this product is far superior. Installation took just over an hour for a DIY novice, and our two Cavaliers' are using it without any trouble. Thankfully I didn't pay $500 or more for a new glass panel (not including installation costs) and ordered here. It also was delivered right on time.